The Festival of Golf will see PGA Professionals celebrate the sport alongside amateur golfers of all abilities, through unique competitions that will be held over the award-winning golf courses from 7th – 14th February 2019. 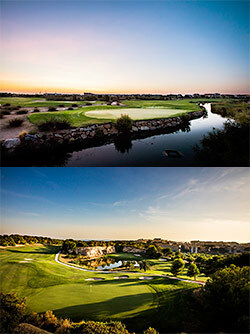 The celebrations at Lumine will start with the Costa Daurada International Pro-Am, hosted from 7th – 10th February. The tournament calls for one PGA Professional and three amateur players to battle it out over the renowned Lakes and Hills courses. For this event, players will share the full Lumine experience. Entrants will enjoy a 5-night stay at the Sol Port Cambrils, a 4* hotel, as well as four rounds of golf at Lumine. On top of this, the players will be provided full use of practice facilities, meals in the Lumine Lakes restaurant and an invitation to the prize giving at the end. The package, giving competitors the chance to see what makes Lumine one of the best golfing destinations in Europe, is available for €1,295pp. Following this event, the PGAs of Europe Fourball Championship will feature at Lumine. The 2019 edition of the tournament will be hosted across Lumine’s Championship Lakes and Hills courses from 11th – 14th February 2019 and see up to 120 pairs competing in a 54-hole fourball better ball stroke play event. Any male or female PGA members and trainees, within a PGAs of Europe Member Country PGA, are invited to enter to have the chance to compete for a guaranteed prize fund of €30,000. Calle Carlsson, General Manager at Lumine Mediterránea Beach & Golf Club, said: “There has been a great deal of anticipation for our Golf Festival in 2019, and we always look forward to welcoming back the PGAs of Europe and their Fourball competitors. The Greg Norman-designed Lakes course and the Hills course will stage the event just week after playing host to European Tour Qualifying School – Final Stage. The Lakes is the most technically difficult of the two, positioned on the lowest lying land on the property. The 6,300-metre, Par 71 course, navigates its way through areas of wetlands and natural vegetation, offering a links design that is a genuine challenge for any golfer. Meanwhile, Lumine Hills, a 6,334-metre, par-72, undoubtedly gives players the most spectacular views from the resort, rolling through leafy woods of white pine and extensive plantations of olive and carob trees.